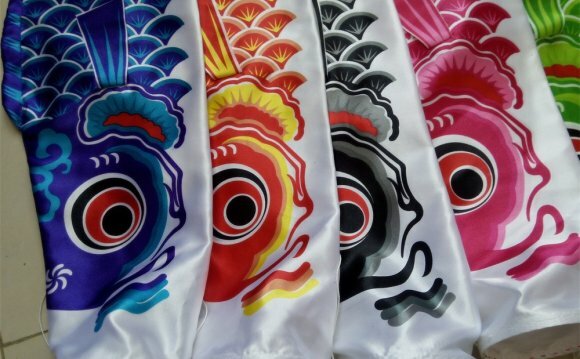 "Koinobori", carp windsocks, carp streamers or carp banners, decorate the landscape of Japan from April through early May, in honor of Children's Day (originally Boys' festival) on May 5. In Japanese culture, the carp symbolizes courage and strength because of its ability to swim up a waterfall. The Boys' Festival was an event, expressing hope that each boy in the family will grow up healthy and strong like wild carps. During this festival, people set up a warrior doll or a yoroi armor set in the house, and Koinobori, huge carp-shaped windsocks, outside the house. Boys' Festival in the Edo era Originally, the banners were used by samurai warriors on the battlefield. Whenever the ancient warriors were on the battlefield, they wore full yoroi armor and flew banners. The banners were painted in various colors and shapes. Some of them had carp pictures on them. They became "carp banners" at the beginning of the modern age. Since the carp's courage and strength is a trait desired in boys, families traditionally have flown koinobori from their homes to honor their sons. A typical koinobori set consists of, from the top of the pole down, a pair of arrow-spoked wheels (yaguruma) with a ball-shaped spinning vane, top streamer (fukinagashi) that looks like a windsock, a black koinobori and a red koinobori. If more children are in the household, an additional blue, green and then purple or orange koinobori are added. These carp sets are flown above the roofs of houses, with the biggest black koinobori for the father, next biggest red for the mother, and ranging down to the smallest carp for the youngest child.